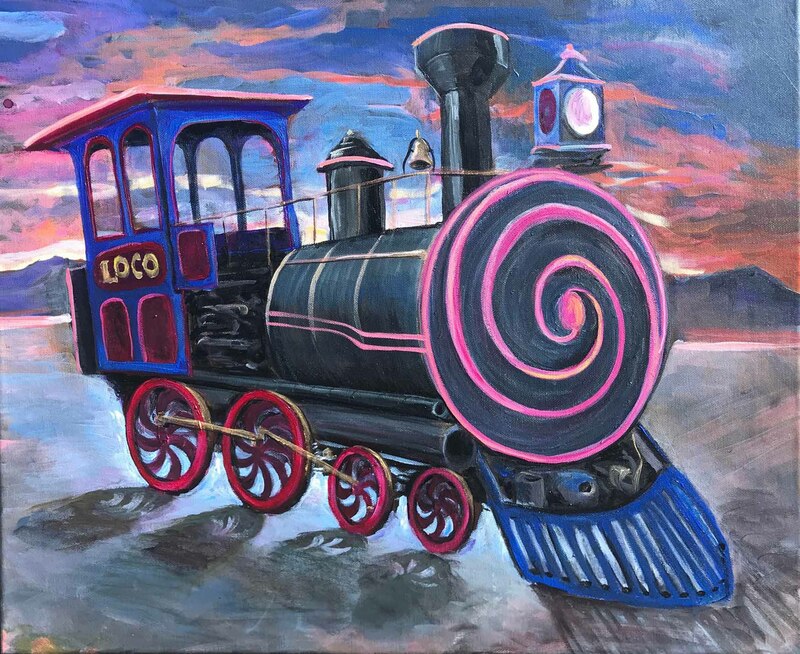 Check out the Loco Motive, our 2018 Burning Man project — The LOCO Motive! Imagine a loco motive driving backwards, in circles, and with dizzying lights. It looks like an old school steam train from a distance, but up close it’s full of dizzy, spinning, optical illusions. The first image shows our visual concept of the Loco Motive with night lighting — spiral lighting in front, pulsing LEDs along the side and on the roof, glowing lighting underneath. The second image is a to scale sketch of the loco motive, showing how it will fit around the bus. You can see the outline of the bus in pale orange under the sketch. We are an experienced Burning Man mutant vehicle crew, who loves nothing more than to create a compelling experience for our riders, so that the journey of traversing around the playa is as much fun as getting anywhere. With our mutant vehicle “Loco Motive”, we seek to have fun increasing the disorientation at Burning Man that opens the mind to new experiences and new levels of creativity. Our vehicle is a giant visible metaphor for the disconnect between mundane reality and the surreal realms of our imaginations, a place we can occupy with “loco” motives — those desires and intentions that don’t make sense but are a lot of fun to express. As a mutant vehicle we enjoy providing rides to view the art in the playa all night long, and a few times in the day. We have DJs playing several of our night tours. Our riders will not only enjoy our disorienting optical illusions, but also our random and useless gears, switches, and blinking LEDs in our engineers’ cabin. The plan for the rear is to convey a “loco”, inverted jet engine. As you can see from our rear view design sketch, at the top will be the driver’s cab. Underneath will be a large 8 foot diameter circle with jet engine blade cutouts over a panel of controllable LEDs. 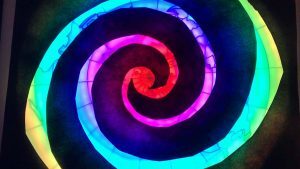 This circle will be very bright and visible from across the playa. It will be animated with controllable LEDs. We have been experimenting with the effect of layering cutouts over a panel of controllable LEDs, see image. 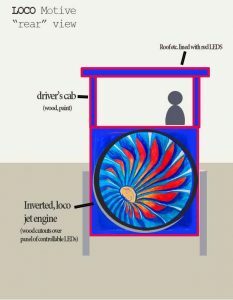 This effect will be used for both the front and the back of the train — as a spiral in the front, and the inverted jet engine blades in the back. The Loco Motive starts out as a 28 foot 1982 carpenter bus with a platform on top. For Burning Man we start by adding stairs on the outside going up to the platform. Then, we add the basic train frame: a giant cylinder in front, a train engineer’s cab in back, train wheels, steam stack. Visual elements are added such as piping, gears, wires. Then, we add our loco ness! A giant LED spiral in the front, pulsing LEDs along the side, and optical illusion spiral wheels. The vehicle is painted as indicated in our concept design. It will look like it is driving forward, but is driving backwards. The cylinder will be made of thin wood door skin wrapped over a curved wood frame, and then painted black with gold trim. We only make 1/2 of the cyclinder on each side (a 12 foot wide by about 8 foot tall 1/2 cylinder), which will be suspended from the top platform rail. We will be standing on the flat platform on the top. The top steamstacks will use a similar method. Please note we have successfully used this method for making large cylinder shapes in the past. The front and rear large LED panels will be made of wood, acrylic, and LEDs, again using a method we have successfully developed in past projects. (Please see our portfolio including past mutant vehicles at http://totallylegitllc.com). The engineer’s cab will be made of wood, and painted. The wheels and gears will also be made of wood, using a large bed router. 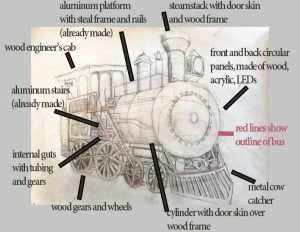 The steampunk-like layers of mechanical tubing and gears conveying internal machinery guts will be made in part with found objects, so a mix of PVC, metal, and wood painted. The vehicle starts as a large square bus that already has a platform on it. Nothing will come off the bus in the process of converting it into a train. We add the external stairs, the main cylinder, the front and pack circular LED panels, the wooden engineer’s cab, and an underlayer of painted textured panels to obscure any remnants of bus visibility. Then we put on the tubing, the wheels, the steam stack, and the cow catcher. By the time we are done, the bus will be entirely obscured, encased in painted panels and layers of “mechanical guts” any where you do not see the other large features (the cylinder, the cab, the wheels, and the gears). To help better see what is being built where, we have added an image some more explanatory labels. 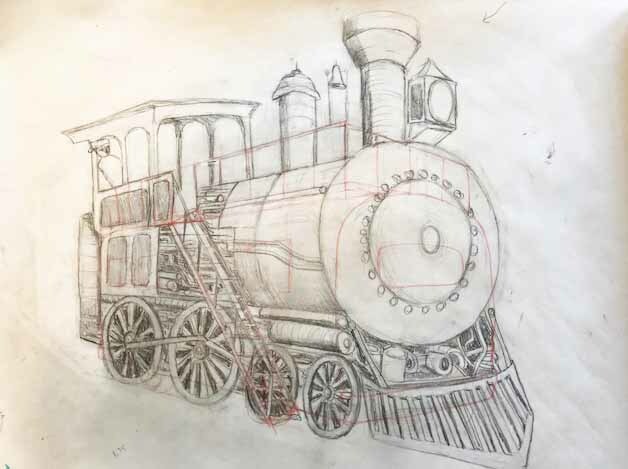 The vehicle’s lighting will largely be comprised of controllable LED strips, and is intended to a) show the shape of the loco motive from a distance, and b) pulse in the spiral on the front of the cylinder and in the optical illusion spiral wheels. We will also have flood lighting under the vehicle to give the impression that it is floating. See design concept image. The bus, platform, and stairs are very solidly crafted and were quite robust in past incarnations of this vehicle (including last years’ Attacks from Mars Pinball Machine, Cloud City, NSS Triton and the CakeWalk). The platform has a railing and the stairs have a railing. We do not let people on or off the bus while it is moving, so the stairs have a gate we close when we need to prevent access. All of our electrical system is outside the railing or under the floor to prevent people from tripping over it. The bus is run by a minimum four person crew — the driver, a spotter in front, a spotter in back, and a person who stays at the top of the stairs (the greeter) to prevent anyone from trying to jump on when we are driving. When we are close to the camp or in a crowd, we send the spotter out in front of the bus to clear the way as we exit the area. A fire extinguisher and first aid kit are kept inside the bus. We only provide access to top of the bus to the public. The inside of the bus is for the crew only, where we keep materials for maintenance and safety of the bus on hand. The biggest challenges we have faced in communicating over the sounds of the crowd across the large bus, so we equip the front spotter and the greeter with megaphones.